Kalettes, the Brussels sprouts and kale hybrid, is ramping up its marketing strategy and focusing efforts in the Southeast, targeting PR, social media awareness and digital advertising in hopes to build greater brand awareness. The new vegetable has had great consumer awareness and seen tremendous momentum in retail and foodservice showing up on menus across the country since its launch three years ago. Kalettes was also featured in Time magazine and the James Beard Foundation blog. The new marketing push aims to increase awareness and boost the fan base. Kalettes are the product of more than a decade of research by Tozer Seeds, one of the larger family-owned vegetable breeding companies in England. The kale and Brussels sprout hybrid offers a fresh fusion of sweet and nutty, combining the best traits of each of its parent vegetables. Kalettes are not genetically modified and were developed by cross-pollinating Brussels sprouts with kale through traditional methods. Tozer Seeds has exclusive marketing agreements with select companies to grow and market Kalettes to create a consistent name and brand identity, which would allow consumers to easily recognize this new vegetable. The companies who have entered into the marketing agreement with Tozer for Kalettes are 4Earth Farms, Classic Salads and Ocean Mist Farms. As part of the agreement, Kalettes seeds will be sold by Johnny’s Selected Seeds to small farmers and home growers. Kalettes are available through many foodservice distributors. This entry was posted in Uncategorized on February 28, 2017 by ReedTMS. Food trends come and go. But for ones that gain traction, they certainly can influence what you grow. So, what’s cookin’? According to noted “Supermarket Guru” and author Phil Lempert, sustainability is among the top trends shaping the culinary world in 2017. Surveys show more consumers today care about where their food is coming from, who is doing the growing, and how it is grown. Beyond just a trend now, the grow-local/buy-local movement has spread its roots and is gaining ground with each passing year. And you have adapted/are adapting. More growers are partnering to provide that local flavor being sought. During a cole crops field day I attended in Hastings, FL, this past November, Candace Anderson of Bejo Seeds spoke about alternative crops for local growers to consider. Among the items on her list were selections fueled by current consumer food trends. The lineup featured Brussels sprouts, broccoli rabe, beets, carrots, and Asian veggies. Some of the selections on the list were a surprise. Who would have ever thought Brussels spouts would be a gastronomic darling? And beets, really? However, as I dug further in my search for more emerging trends, there was a growing consensus among what I found. 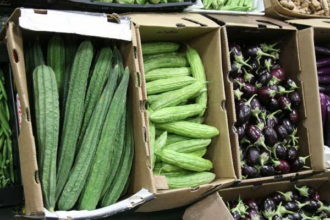 Asian veggies like eggplant and Luffa gourd are hot right now. According to a recently published study, locally grown Asian vegetables are trending in the U.S. This not only jibes with what I heard during the field day, but also it is good news for growers who already have found that niche, and others possibly seeking one. Per the study, a research team — which included input from UF/IFAS scientists — set out to find intel about how much money consumers spent on ethnic vegetables and herbs. From there, the researchers used the consumer choices to test numerous cultivars at university plots in Florida, New Jersey, and Massachusetts. According to results, the following cultivars were the most popular for Asian-Indian consumers: bitter gourd, eggplant, cluster beans, bottle gourds, turmeric, fenugreek, sorrel spinach, and radish greens. Are you growing any of these? I can think of a few operations around the Tri-County Agricultural Area that are. And based on statistics from the U.S. Census Bureau, the American population is expected to include 40 million Asians by 2030. Sounds like an opportunity too good to pass up. In addition to sustainability, Lempert says “enhanced foods” are hot. Enriched with nutritious components like antioxidants, herbs, and extra protein, mundane food becomes superfood. He predicts more of this to come from items like matcha (a fine powder ground from specially grown and processed green tea), butter, botanicals, edible cannabis, and (once again) beets. Need another case in point? If you haven’t checked out what Ft. Pierce, FL-based Natalie’s Orchid Island Juice Co. is serving up lately, you might be surprised to find other fruit and now veggies among its award-winning citrus juice selections. New juices include: Carrot Tomato Celery; Pumpkin Apple Spice; and yes, Orange Beet. If you can’t beat (beet) ’em, join ’em. This entry was posted in Uncategorized on February 21, 2017 by ReedTMS. “Can we get a dragon fruit while we’re out?” my 13-year-old daughter asked one day when we were out shopping. “When have you ever had dragon fruit?” I asked. So, we went hunting for dragon fruit. Unfortunately on that particular day in Kansas, there were no dragon fruit to be found in the stores we visited. We’re keeping a weather eye out for them, though. I read a lot of stories about produce being marketed to kids (and the parents of those kids). Over and over again, I hear marketers say things like they want their products to be something kids will choose over candy. It seems that many marketers want to put out a candy bar and a piece of cantaloupe and expect the kids to choose the cantaloupe. I am sure there’s a rare child out there who might choose the cantaloupe, but they don’t live in my house or in any of my friends’ houses. But my daughter’s request for dragon fruit proves that you can successfully market to kids, even if they may never choose produce over a candy bar. When my girls were babies, they did not like baby food vegetables. They were all about the little jars of fruit baby food, but throw some green beans or carrots in the mix and more of it ended up on them and me than in their stomachs. Our doctor told us the key was to keep exposing them to it because it took nearly a dozen times for them to get used to the new flavor. After a couple of weeks of continually offering them the vegetables, they stopped spitting it on me and started eating it and asking for more. The more exposure children get to something different, the more likely they are to start eating it on their own. Produce doesn’t come in a fancy wrapper. There’s no toy inside the box. But continually exposing today’s youth to the different flavors available to them is the best way to increase their consumption. My daughter had never had a dragon fruit before she went on a cruise with her grandparents last summer. But on that cruise, she was exposed to it numerous times. She had it enough times that six months later in the dead of winter in Kansas, she asked for it. The more opportunities our kids have to try something new, the more likely they are to become lifetime consumers. If marketing programs aimed at kids become less about competing with candy and potato chips and more about introducing kids over and over again to the produce flavors available to them, then kids will begin creating lifelong eating habits where they can enjoy both a dragon fruit and the occasional chocolate bar in their diets. Programs that put salad bars in schools (my 15-year-old daughter might eat school lunch if that was an option at her school), sampling programs in grocery stores that target children (put the sampling table at eye level for kids or give them a designated sampling station in the produce department) and education programs that allow teachers to teach good eating habits and offer a taste of different produce are all great ideas for creating more exposure for produce with the under-18 set. Produce marketers need to stop looking at candy as their competition. Produce is a great-tasting product on its own — plus it has health benefits that appeal to parents. Those who market to kids need to focus on the merits of their own product and not set it up as a competitor or alternative to candy. Kids don’t see it that way. In a head-to-head showdown, candy wins for 99% of kids. And that’s OK. Kids don’t have to choose between produce and candy. Hopefully, they’re choosing more produce than candy. To make that happen, marketers should focus their efforts on figuring out more ways to get produce in the hands of kids and not worry about whether those kids also eat a chocolate bar. Story By: Lori Fairchild editor of The Packer’s Produce Market Guide. This entry was posted in Produce News on February 20, 2017 by ReedTMS. Lidl, one of world’s largest retailers, will launch its expansion into the United States ahead of schedule and will open its first 20 U.S. stores in the summer of 2017. The first wave of stores will be located in Virginia, North Carolina and South Carolina. Within one year of opening, Lidl plans to establish up to 100 stores across the East Coast and will create approximately 4,000 new jobs in store over the same period. Lidl first established its U.S. headquarters in Arlington Country, VA, in June 2015. Since then, it has announced regional headquarters and distribution centers in Spotsylvania County, VA; Alamance County, NC, and Cecil County, MD. Lidl operates about 10,000 stores in 27 countries throughout Europe, offering customers high-quality fresh produce, meat, bakery items and a wide array of household products at the lowest possible prices. This entry was posted in Uncategorized on February 16, 2017 by ReedTMS. Congratulations to Grant Key, ReedTMS Logistics’ employee of the month! Grant has been an incredible asset to the company and is constantly regarded by his peers as one of the most dependable employees in the entire office. Thanks for all you do Grant, keep up the good work! This entry was posted in Prize Wheel on February 15, 2017 by ReedTMS. The World Apple and Pear Association (WAPA) released Southern Hemisphere production forecasts for apples and pears that shows mixed trends. The group, convening at the Fruit Logistica produce trade show and conference on Feb. 10, estimates 2017 apple production in the Southern Hemisphere at 5.43 million metric tons, up 9% from the 2016 crop, according to a news release. Dropping slightly, Southern Hemisphere pear production in 2017 is forecast at 1.341 million metric tons, 2% lower than 2016. Exports of Southern Hemisphere apples are forecast stable at 1.665 million metric tons, while pear exports from the Southern Hemisphere are expected to decrease 6% to 656,000 metric tons, according to the release. The estimates from members in Argentina, Australia, Brazil, Chile, New Zealand and South Africa. Also at the meeting, Todd Fryhover, president of the Washington Apple Commission, was elected president of WAPA. The new vice-president of the group is Nicholas Dicey from the South African Apple and Pear Association, according to the release. The group is scheduled to meet in August at the Prognosfruit Conference in Lleida, in the Catalonia region of Spain, to release the Northern Hemisphere 2017-18 crop estimates. This entry was posted in Produce News on February 13, 2017 by ReedTMS.